Hey Friends! We have had a number of people mention that they are coming to our Ladies Night Out with Stila Cosmetics, but are planning on buying a ticket at Shoppers Drug Mart the night of… just a note that you need to buy your ticket in advance:) We need to make sure that everyone gets a chance with a makeup artist..that’s why you’re comin right? Well, ok, you want the nifty gifty bags, which are gonna be good!! Oh ya, and the complimentary eyebrow threading and the 20x the points at Shoppers when you spend $75. 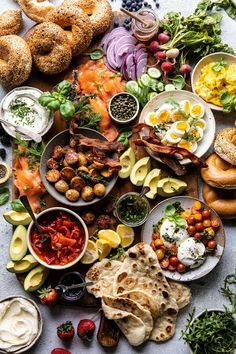 Seriously too many goodies to mention! Thanks to all that already have their tix in hand..can’t wait to see you! 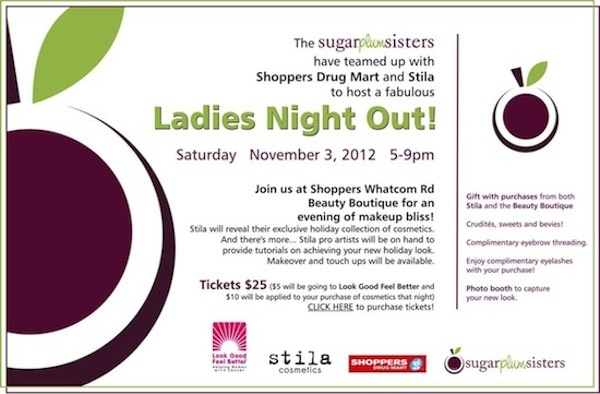 We are beyond excited to invite our friends and followers to what promises to be a fabulous night at Shoppers Drug Mart! Mark your calendars for Nov 3rd and join us for an evening of makeup heaven. Makeovers, touchups, gifts, appies? SO FUN! And to make it even better, the evening celebrates Look Good, Feel Better, Canada’s only cancer charity dedicated to empowering women to manage the effects that cancer and its treatment have on their appearance, and often on their morale. $5 from every ticket purchase will be donated to this awesome charity! Click the below invite to see the deets! !